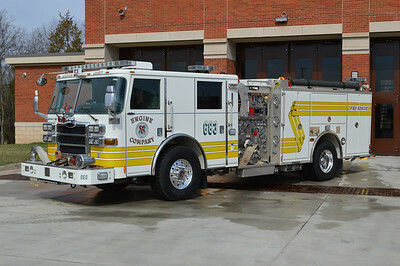 Reserve Engine 683 was photographed in April of 2015 running first out of Fire Station 9 in Brambleton. It was just washed. 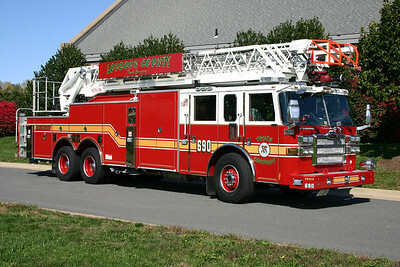 It is a 2008 Pierce Dash 1500/750/50 that originally ran as Middleburg Engine 603. It was transferred to a reserve engine in May of 2014. 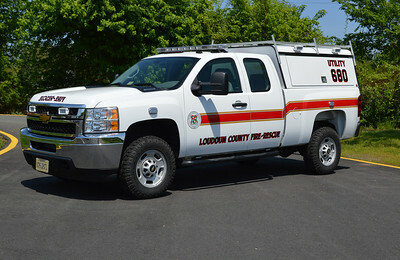 Loudoun County's Reserve Truck was photographed at Ashburn Station 6 just prior to going into service. The new Pierce has spent time at stations with ladder trucks so crews could have the opportunity to train on the new tower since it will be a county wide reserve truck. 2018 Pierce Velocity 100'. Pierce job number 32194. Note the red painted aerial. 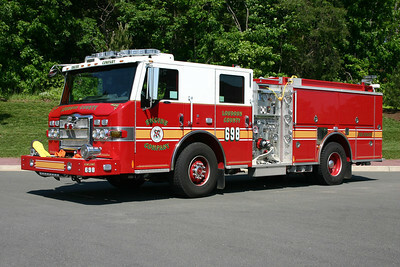 Truck 690, a 2008 Pierce Dash 105' rearmount, performs two roles. 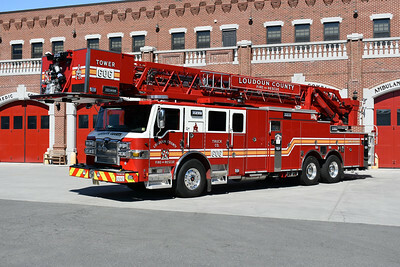 It is a county wide reserve truck when needed and is also a Training Center ladder truck, where it is kept. It was delivered along with two Training Center Pierce engines. This photograph was taken at Leesburg Fire Station 20, just as it was ready to leave for another reserve truck assignment. Photographed in September of 2013 while filling in for Tanker 616 in Neersville, Tanker 680 is a 2005 International 7600 4x4/Pierce 1500/3000 tanker. This was the county's first county purchased 3,000 gallon water tank designed for the western end. 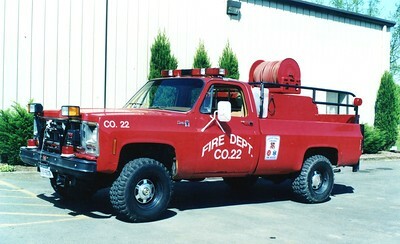 The International originally saw service as Tanker 5 in Hamilton. 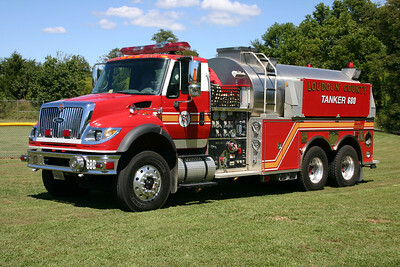 Once leaving Hamilton and serving a brief assignment as a reserve, the International became Tanker 612 in Lovettsville when Lovettsville sold their 1999 Pierce Dash tanker. In 2013, the International went back into reserve status as Tanker 680. 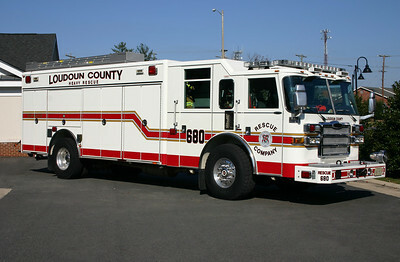 This is the county's reserve squad, Rescue 680. 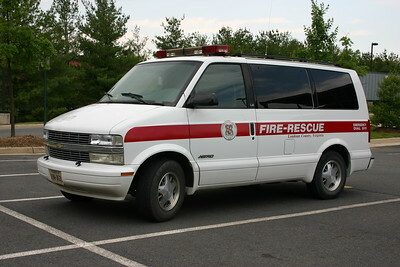 The 2007 Pierce Dash was originally Rescue 603 in Middleburg where the stripes were painted yellow. 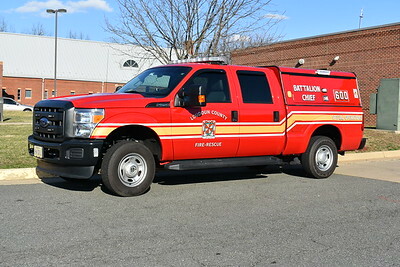 In November of 2010, it transferred to Aldie Station 7 where it was Rescue 607, Aldie's first heavy squad. 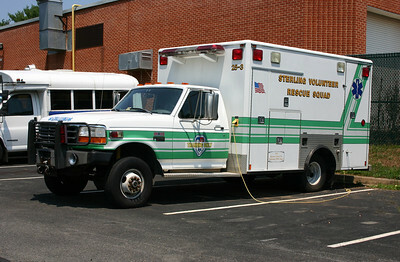 In 2012, it became the county reserve squad - Rescue 680. I have had trouble tracking this one down. Each time I thought it was at the Training Center or the Ashburn county shop it turned out it was filling in at a station. While photographing some of the Training Center apparatus in November of 2012, I was told that R-680 was filling in at Rescue Station 13 in Leesburg. After photographing many fire and rescue apparatus throughout Loudoun County stations, I have come to the conclusion that Station 13 is the most difficult to get photos. The crew was great moving the Pierce around.....the tight turns, not a lot of room to turn around, and somehow me always showing up with the sun on the opposite side presents challenges. Again, a great crew willing to take the time to move around the apparatus makes for an acceptable photograph. 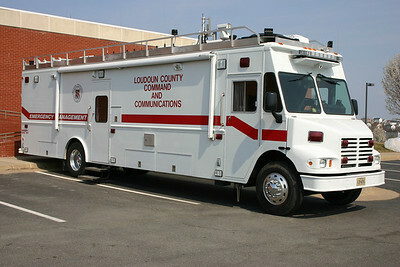 The Loudoun County Command and Communications Unit - "Mobile Command Post 680". It is a 2005 Freightliner MT55/Grumman-Olsen/LVI/Bickford. Some of the features it is equipped with include 4 command consoles, media relations console, on-board weather, command/conference room area, mast mounted camera, and an observation platform. Originally housed at the Training Center, it is now garaged at the Loudoun County Fire/Rescue warehouse on Red Rum Drive in Ashburn. 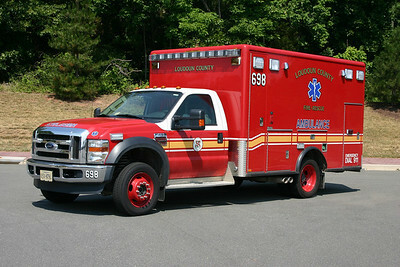 When not being used, Reserve Ambulance 698 is kept at Loudoun County's fire and rescue warehouse in Ashburn. 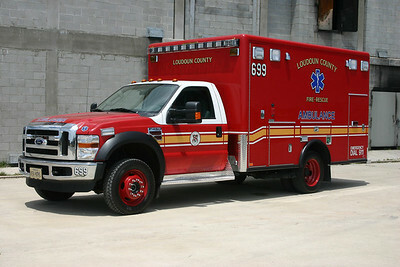 698 is a 2008 Ford F450 built by Horton. 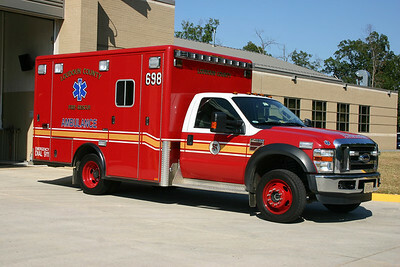 Reserve Ambulance 698, a 2008 Ford F450/Horton. This was photographed on the ramp of the new Fire Station 23 in July of 2011. 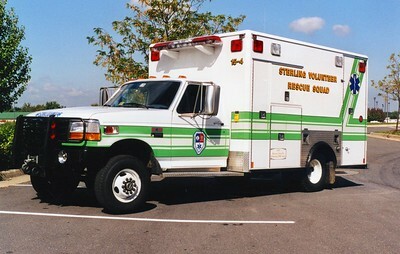 Ambulance 699 is also a part of the reserve pool, and is a 2008 Ford F450/2009 Horton. Photographed at the Training Center burn building. This is UTV 687. UTV means Utility Task Vehicle. UTV 687 is a 2012 Kawasaki with the capability of carrying a stretcher in the back. Although photographed at the Training Center, it will probably be kept at a Loudoun County station and provide support at large crowd events. Safety 600, a 2014 Dodge Ram. 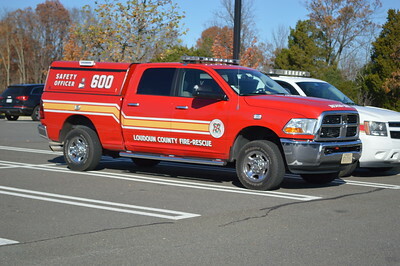 Loudoun County BC 600 as photographed in February of 2017. 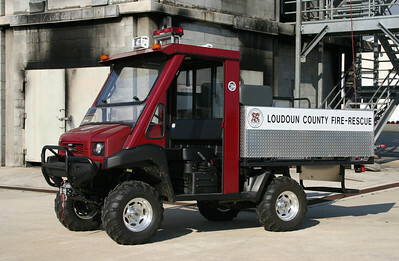 Battalion Chief 601 received the first BC buggy painted in the new colors for Loudoun County. 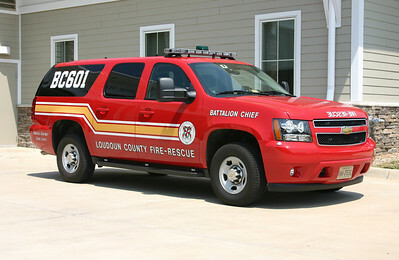 BC 601 is a 2012 Chevrolet Suburban outfitted by Fastlane of Purcellville. 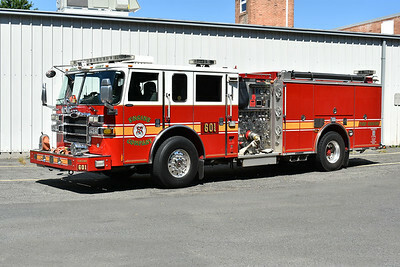 BC 601 was photographed at Station 22 in Ashburn-Lansdowne where BC 601 is housed. 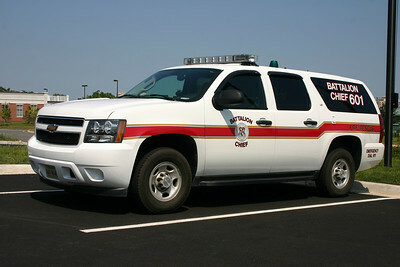 The former Battalion Chief 601 as photographed at Station 22 - a 2007 Chevrolet Suburban outfitted by FastLane. 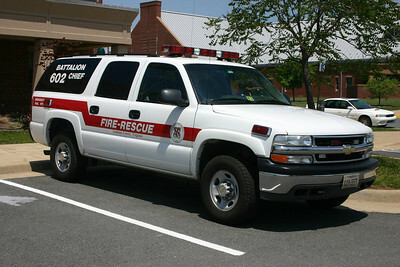 Battalion Chief 602 photographed at Station 20 in Leesburg back in 2006. It is a 2003 Chevrolet Suburban outfitted by P&L Custom. 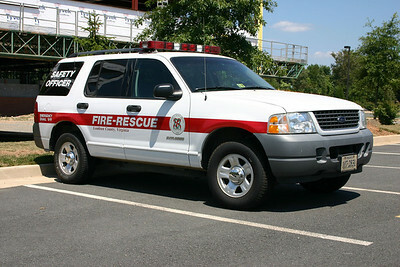 Ex- Safety officer vehicle photographed in 2006 - 2005 Ford Explorer. 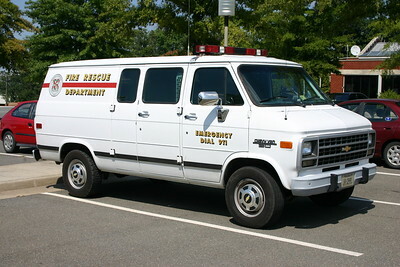 A Chevy Astro support unit found at the Training Academy. 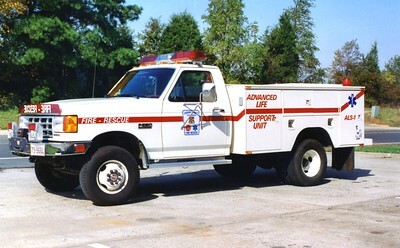 Former ALS 1, a 1989 Ford F-350/Knapheide. 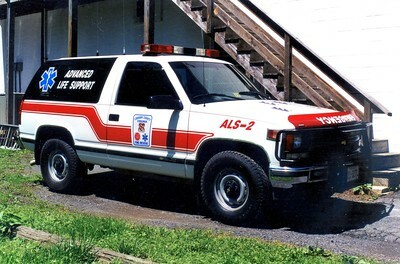 Former ALS 2, a 1995 Chevy 1500/Odyssey.